Two of the most gifted poets of their generation, Taniel Varoujan and Roupen Sevag, were almost the same age (Varoujan was a year older), and were friends in life and in death. Roupen Chilingirian was born in Silivri, a city in Eastern Thrace (European Turkey) 37 miles from Constantinople, on February 28, 1885. He belonged to a well-to-do family, and had two sisters and three brothers. He studied at the local Askanazian School and then went to the American lyceum of Bardizag from 1899-1901. Then he entered the renowned Berberian School of Scutari, in Constantinople, which he graduated with highest grades in 1905. Reteos Berberian, a famous pedagogue and founding director of the school, noticed his interest in science. He advised him to go to Switzerland and pursue a career in medicine. Thus, he entered the medical school of the University of Lausanne, where he studied for the next six years. In 1905 the medical student published his first poem in the newspaper “Masis.” Two years later, he adopted the pseudonym Roupen Sevag (sevag = “black eyes”) and published his first piece in prose. 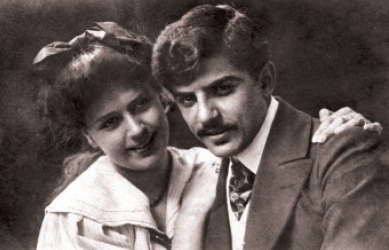 In the same year (1907) he met Helene (Jannie) Apell, a seventeen-year-old student at the girls’ lyceum of Lausanne, who was from an influential German military family. They fell in love, but they had to overcome the resistance of both of their families. 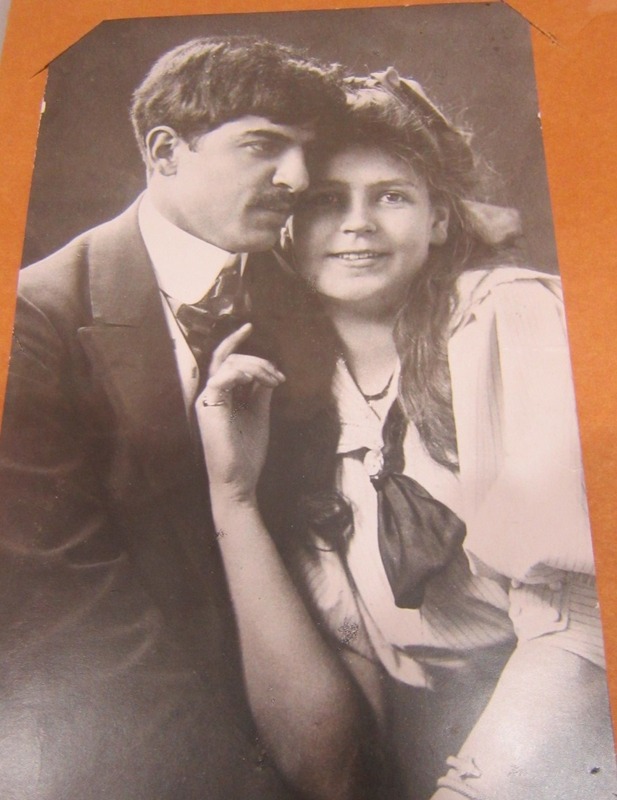 Finally, they married in Lausanne in 1910, while the religious ceremony was held in the Armenian Church of Paris. Sevag published prolifically in the period between 1908-1914 in newspapers and literary journals of Constantinople and Smyrna, as well as in the publications of the Mekhitarist Fathers of Venice. During a vacation in Constantinople, he founded the short-lived newspaper Surhantag (1908) with a group of friends. He was also involved in political activities, and became a member of the Armenian Revolutionary Federation. In 1910 he published his first book of poetry, The Red Book, where the echoes of the Adana massacres of 1909 were noticeable. He planned to gather many other lyrical and patriotic poems in three more books, but this would never happen. an at a hospital and a clinic in Lausanne. His medical experience would lead him to publish a series of fine short stories under the general title of Pages from the Doctor’s Journal, which would be posthumously published. His poetry and prose made him well-known in Armenian literary circles. He settled with his wife and their two-year old son Levon, in Constantinople in May 1914. Their daughter Shamiram would be born a few months later. He was conscripted in November 1914, when the Ottoman Empire entered World War I, and began to serve as a military physician in Chanakkale and Istanbul. After the roundup of April 24, 1915, he was arrested on June 22 and exiled to Chankiri, where he arrived six days later. His wife, supported by her parents in Switzerland, started a frantic round of correspondence and interviews with the German embassy and the Ottoman authorities to secure his liberation. Efforts by the family and the embassy, which were a matter of discussion between Germany and the Ottoman government from July-August 1915, would be fruitless. When in Cankiri, Sevag continued his medical activities. He cured the daughter of a Turkish chete (bandit), Arabaji Ismail. The latter asked him to save himself by converting to Islam and marrying his daughter, but Sevag refused the offer. On August 26, 1915, Roupen Sevag, Taniel Varoujan, and three other prisoners who had been victims of the roundup by sheer chance were dispatched to Ayash. Six hours away from Cankiri, in a place called Tuney, a group of Kurdish bandits organized by the local secretary of the Committee of Union and Progress, Oghuz, savagely killed the five unfortunate prisoners. Documentation from the Ottoman Interior Ministry, recently published by historian Taner Akcam, shows that Talaat Pasha himself was involved, if not the killing itself, but the subsequent release of the criminals and the care for their welfare. 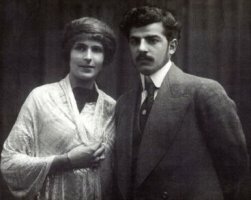 The efforts of Janni Chilingirian-Apell to save her husband had not been welcome either by the Ottoman government or, more importantly, the German embassy. On September 11 the Interior Ministry conveyed information about the murder to the embassy and suggested that Sevag’s widow be sent to Germany with her children. They actually left for Switzerland. She continued to pursue justice, but to no avail. Her final letter to the Germany embassy from Lausanne, on November 27, 1915, contained a strongly-worded appeal for the crimes that were committed against Armenians and her husband: “Try to save whatever you can save by using the most definite resolve. If you do not make use of every possibility within your possession, the blood of innocent women, children, the sickly, and the elderly will ascend to the heavens and damn Germany.” Her anger against the betrayal of her country was so deep that she would refuse to teach her children a word of German, and she would keep and pass Roupen Sevag’s memory to them until her death in 1967. Levon Chilingirian passed away at the age of 93, in 2005, and Shamiram Folco-Sevag is still alive at the ripe age of 102. In 1942 the editor of the journal Sovetakan Grakanutiun of Yerevan, Rouben Zarian, published three poems of an eighteen-year-old unknown poet, Paruyr Ghazarian. In memory of Roupen Sevag, he decided to use his last name and create a pseudonym for the promising poet. The career of one of the luminaries of Soviet Armenian poetry, Paruyr Sevak (1924-1971), had started. In the 1980s Roupen Sevag’s nephew, Hovhannes Chilingirian, founded the Roupen Sevag house-museum in Nice (France), which was moved to Holy Etchmiadzin in 2013. A school was named after Sevag in Yerevan (1995). Previous entries in “This Week in Armenian History” are on the Prelacy’s web site (www.armenianprelacy.org). Sergey Mergelyan was an outstanding, world-famous mathematician, who established the grounds for the development of information technology in Armenia. He was born in Simferopol, Crimea (then Russia), on May 19, 1928. His father Mkrtich Mergelov was born in Akhalkalak (Javakhk), and his mother Ludmila was Russian. Mergelov founded a factory of paper in 1936, but he was exiled to Siberia with his family for engaging in private economic activities. His wife and son were somehow able to return after a year of exile. Later, he was also freed and, before the German attack on the Soviet Union in June 1941, he met by chance Kristapor Toumanian, deputy commissar (minister) of Industrial Cooperation of Armenia, who suggested that he come to Armenia and found a factory for the production of cartons. In late 1941 the Mergelovs moved to Yerevan. It was a completely foreign environment for the Russian-educated young Sergey, who knew no Armenian and was unaware of Armenian culture. But he went on to become a perfect speaker of the language, with deep feeling for the culture of his people. Years later, his surname would become Mergelyan. He showed his precocious talent in school years. He won the republican Olympics of mathematics and physics when an eighth grader at Mravian School. Afterwards, he rendered the exams for ninth and tenth grades, and entered the School of Physics and Mathematics of Yerevan State University in 1944, at the age of sixteen. He passed the first year and most of the second year courses in one year, and started attending third year courses. Mergelyan graduated in three and a half years, instead of the normal five, and in 1947 he was sent to Moscow for graduate work at the Steklov Mathematics Institute of the Academy of Sciences of the Soviet Union (now the Russian Academy of Sciences). Just two years later, on February 19, 1949, he defended his Ph.D. dissertation on the approximation theory in mathematical functions. The scientific council of the institute assessed it as a study of exceptional value, and unanimously awarded him both Ph.D. and Doctor of Science degrees. The acquisition of the highest degree of Doctor of Science at the age of twenty-one became a record, unbeaten to this day, in the former USSR and present-day Russia. In 1951 Mergelyan developed a powerful method that allowed him to demonstrate his famous theorem of approximation by polynomials (the “Mergelyan theorem”), giving the ultimate solution to a chain of studies started in 1885 by mathematicians Karl Weierstrass and Carl Runge. Later works would include theory of functions of complex variables, theory of approximation, and theory of potential and harmonic functions. His work would lay the ground for the modern complex approximation theory. 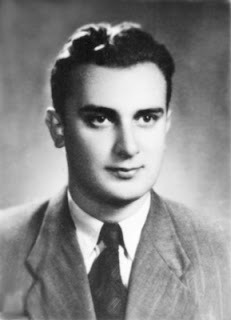 Mergelyan won the USSR State Prize in 1952, and the following year he established another unbroken record as he became a corresponding member of the Soviet and the Armenian Academies of Sciences at the age of twenty-five. This was an honor, whether in Russia or in Armenia, that many remarkable scientists were unable to achieve in their entire lifetime. The young mathematician was a poster boy for propaganda of Soviet science abroad during the next decades. In 1956 Mergelyan became a full member of the Academy of Sciences of Armenia and the founding director of the Yerevan Scientific Research Institute of Mathematical Machines (popularly known as the Mergelyan Institute), an important research facility at Soviet level and a pioneer of the informational technology and software industry in Armenia. At the same time, he taught at Yerevan State University and at the Yerevan Pedagogical Institute. In 1961 he moved to Moscow as deputy academician-secretary of the Mathematics Institute of the Soviet Academy of Sciences, where he created and directed the section of complex analysis until 1970. He returned to Armenia as vice-president of the Armenian Academy of Sciences (1971-1974), and was also chair of Numerical Analysis at Yerevan State University (1972-1979). However, envy and slander would pursue him for the next fifteen years. He was demoted to director of the Computing Center of the Academy (1974-1979), and sector head of the Mathematics Institute (1979-1982). In the end, he would be designated rector of the Pedagogical Institute of Kirovakan (nowadays Vanadzor) from 1982-1986, a minor position in the third city of Armenia that was unbecoming of his status. In 1986 he left Armenia and returned to Russia, where he taught at Moscow State University and worked at the Mathematics Institute. In the 1990s Mergelyan received an invitation to teach in the United States, first at Brown University and then at Cornell University. After a three-year stint, he returned to Moscow, but in the end he came back to America in 1996 with his wife Lidia, and settled in Sacramento. There was a failed attempt to have him return to Armenia in the late 1990s; his wife was already gravely ill with cancer and needed constant medical oversight, and the harsh experience of the 1970-1980s had deeply scarred the elder scientist. Mergelyan’s wife passed away in 2002, and the mathematician moved to Los Angeles. On his eightieth birthday, he received the medal “Mesrop Mashtots” from the government of the Republic of Armenia in May 2008, and his jubilee was celebrated by the Academy of Sciences, a few days later. These final acts of recognition came in the last stage of his life. He died on August 20, 2008. According to his last will, he was buried at the Novodevichie Memorial Cemetery in Moscow, Russia, along his wife and mother. His legacy lives in the generations of students formed by him, and in the institute founded by him in Yerevan, popularly known as “Mergelyan’s Institute,” although it does not officially bear his name. Armenians had an important role in the development of sports in the last years of the Ottoman Empire. Among those pioneers was Vahan Cheraz, who later became one of the founding members of the scout movement of the Armenian General Union of Physical Education (Հայ Մարմնակրթական Ընդհանուր Միութիւն), better known by its initials as Homenetmen (Հ.Մ.Ը.Մ.). Cheraz was born in Constantinople on August 16, 1886. His father Kaspar, a lawyer, was brother of a famous writer and public figure, Minas Cheraz (1852-1929), who had been a member of the Armenian delegation to the Congress of Berlin in 1878, accompanying Khrimian Hayrig. He first studied at the French religious school of St. Benoit, in the neighborhood of Pera (Beyoglu). In 1901 he went to London, where he lived with his uncle Minas and studied for four years. He returned to Constantinople in 1905 and graduated from the Getronagan Armenian School in 1906. In 1905 Shavarsh Krisian, a pioneer of Armenian sports, had founded the first Armenian soccer team, Baltalimanı (many such teams would be named after Armenian districts). Upon his return, Cheraz had brought a soccer ball and founded a soccer team with the students of the Getronagan School, which was called “Santral” (Central, the French translation of the school’s name). In 1906 he founded another team called Proti. 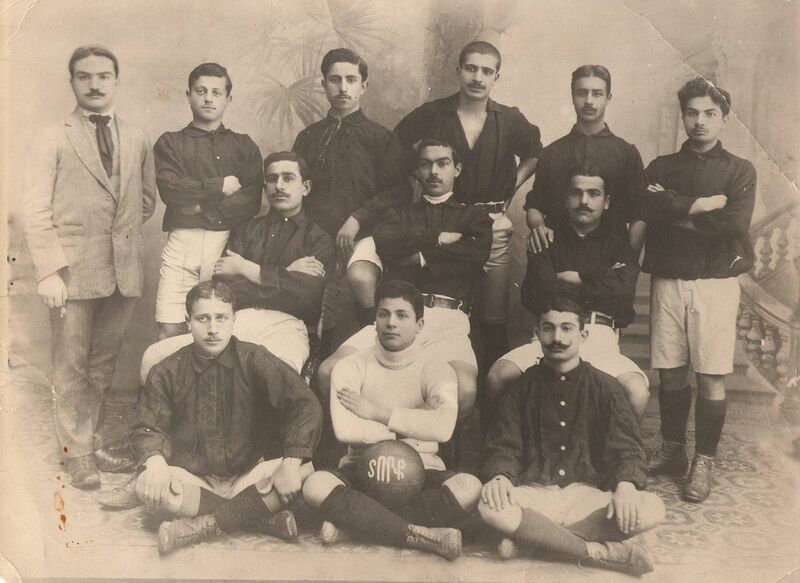 In 1908 both teams merged into the “Tork” team (named after a pagan Armenian god of strength), under his leadership. By 1911 the number of Armenian soccer teams had become 65. “Tork” soccer team in 1911. Vahan Cheraz is pictured sitting in the middle. Meanwhile, he worked from 1906-1911 as an inspector at the Constantinople port. 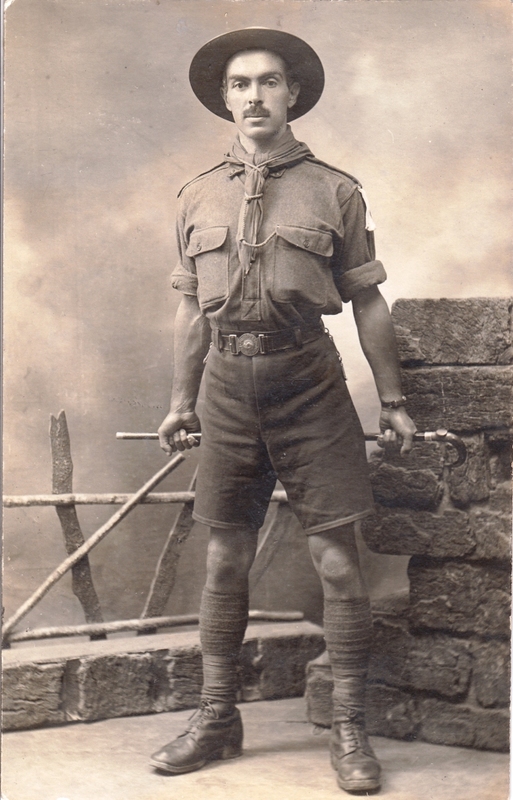 He served in the Ottoman army from 1911-1912, and then he left the capital for Europe. He left for Paris and worked for an antiquarian until 1914. He later moved to Marseilles, where his uncle lived, and after the beginning of World War I, he traveled to Tiflis, where he enrolled in the first battalion of Armenian volunteers, under the command of Antranik, and fought in Persia from 1915-1916. After the dissolution of the volunteer groups, Cheraz went to work in the orphanages of the Russian Union of Cities, in Sarikamish and Erzerum, until 1917. When the October Revolution broke out in November 1917, the Russian troops withdrew from the Caucasian front. Cheraz returned to military service as a member of Antranik’s reorganized battalion and fought in the front in 1917-1918, and later in Persia and Zangezur in 1918-1919. He became seriously ill at the beginning of 1919 and, after almost two months of illness, he went to Constantinople in search of medical treatment. He recovered and became scout head of the recently founded Homenetmen. At the same time, he worked as a translator for the British general headquarters, since Constantinople was under Allied occupation from 1919-1922. Upon the invitation of the government of the Republic of Armenia, Homenetmen was officially invited to share their knowledge and expertise in sports and scouting. The Executive Committee sent three members, Vahan Cheraz, Dikran Khoyan (later pastor of St. Stephen Church in Boston and Soorp Khatch Church in Washington), and Onnig Yazmajian to Yerevan. Their successful efforts were short-lived. After the establishment of the Soviet regime, Homenetmen was banned in the country. In September 1920 the Armenian-Turkish war started, and Cheraz enlisted in the Armenian army. Later, he participated in the February 1921 uprising against the Soviet regime and settled in Alexandropol (later Leninakan, now Gumri). From 1921-1924 he worked for the Near East Relief (known in Armenia as Amerkom, abbreviation for Amerikian komite, “American Committee”) in different capacities, including head of the scouting branch in Alexandropol. He married a survivor of the Armenian Genocide, Vartanush Antreasian, whose first husband, a school principal had been burned alive, along with his students. Cheraz’s tragedy started a few days after his marriage, in November 1924, when he was arrested by the NKVD (predecessor of the KGB) on trumped-up charges of being a spy for England and the United States. He was sentenced to three years of exile in Siberia, but freed after five months thanks to an amnesty. He returned to Armenia, but could not find work, and after a short stint again at the Near East Relief, he remained unemployed. He was arrested again, in September 1927, along with other Armenian employees of the Near East Relief, and imprisoned in Tiflis. He was charged with spying and being a member of the Armenian Revolutionary Federation. He denied both charges, since he had never belonged to a political party. However, the interrogator came to the following “conclusion”: “to recognize [Cheraz] as an element socially dangerous and extremely suspicious in espionage.” On January 9, 1928, he was sentenced to death. Days later, before parting ways with his cellmates, he told them: “Farewell, friends. I know why they are taking me. It doesn’t matter, let them eat my head. But be sure that victory is ours. Don’t despair, remain always brave. Long live free Armenia, long live the Armenian people. Don’t forget me.” He left behind his wife and a one-year-old daughter. His wife Vartanush would be killed in the prison of Gumri during the Stalinist purges of 1937, at the age of 42, falsely accused of being an A.R.F. member and holding meetings of activists at her home, but, essentially, for having been Cheraz’s wife and having a brother abroad. Their ten-year-old orphaned daughter was adopted by her uncle Vartkes Antreasian, who changed her last name, fearing persecution. Buragn Antreasian-Cheraz currently lives in Yerevan. Today, a street in Gumri and a sports school are named after Vahan Cheraz. A plaque on the front of the city’s Tumanian library says: “Vahan Cheraz, founder of the scout movement in Armenia, lived in this house from 1925-1927." From July 27 to August 4, 2016, an exhibition at the National Gallery of Armenia, in Yerevan, commemorated the 130th anniversary of the birth of painter Sarkis Katchadourian. His name is barely known in the homeland, although he is buried there. New York Armenians of a certain age may remember his wife, Vava Sarkis Katchadourian (née Sarian, 1895-1984), also a painter. Sarkis Katchadourian was born in Malatia (Western Armenia) on December 8, 1886. After his elementary studies in his hometown, he went to Erzerum, where he studied at the Sanasarian School. Here he developed his interests in the arts, which would lead him to go to Europe and pursue his artistic studies in such prestigious institutions like the Academy of Fine Arts of Rome (1908-1911) and the National School of Decorative Arts of Paris (1912-1914). At the age of 28, he returned to Erzerum. But soon World War I would start, followed by the catastrophe of the Armenian Genocide. 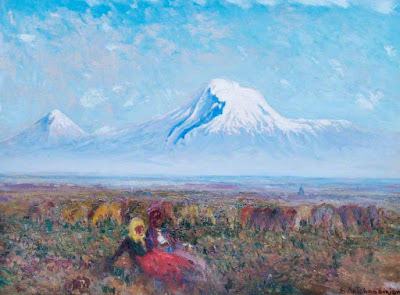 The young painter managed to survive and find refuge in the Caucasus. He lived in Tiflis until 1921. He was a witness of the tragedy of his people, becoming the “singer of Armenian grief” in his paintings, as Hovhannes Toumanian called him. He entered the Society of Armenian Artists of Tiflis in 1917. Katchadourian moved to Yerevan in 1921. The newly established Soviet regime commissioned the design of the first stamps of Soviet Armenia to him. His works reflected life and nature of Armenia, the refugees, national feasts. He also excelled in portraiture. His paintings tended to combined classical principles, especially from Italian art, with the aesthetics of impressionism. However, the painter could not fit into the political environment and soon left Armenia. He settled in Vienna (Austria), where he became a member of the Society of Artists of Vienna. After moving to Paris, he was the founding secretary of the Society of Armenian Artists “Ani.” He would have exhibitions in France, Italy, Great Britain, Egypt, Turkey, the Netherlands, and the United States. Katchadourian became particularly famous after 1931, when he was selected by the government of Iran to restore the frescoes of the mosques and churches of the former capital of the Safavid dynasty, Ispahan. The artist achieved his mission after a detailed study, with amazing results. In 1934 he founded the museum of Armenian art in New Julfa, the Armenian suburb of Ispahan. He produced copies of his work in Ispahan, which were exhibited in Paris (1932 and 1934) and other European cities, as well as in New York (1932). In 1937 Katchadourian went to India to study the famous temple caves of Ajanda (fifth-sixth centuries A.D.), and worked for the next four years to copy the frescoes that remained unknown and inaccessible to art scholars both there and in the island of Ceylon (nowadays Sri-Lanka). The exhibition of his work in Paris, New York, and other cities in 1942 opened a new page in the study of ancient Asiatic art. Sarkis and Vava Katchadourian moved from Paris to New York in 1940. He illustrated Edward Fitzgerald’s English translation of poet Omar Khayyam’s Rubaiyat (1946), with six pictures and 101 drawings. He passed away in Paris on March 4, 1947, after complications from a hernia surgery. In 1971 a cultural agreement was signed between France and Armenia. On the occasion, a series of 37 Indian and Sri Lankan copies by Katchadourian, acquired by the Guimet Museum of Paris, was donated to the National Gallery of Armenia and exhibited in the same year in Yerevan. Through the efforts of his widow, Sarkis Katchadourian’s ashes were moved to Armenia and reburied in Yerevan on December 28, 1977.